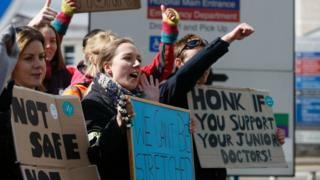 The first-ever all-out doctors' strike is a "bleak day", ministers say, but hospitals seem to be coping well during Tuesday's stoppage in England. Junior doctors walked out of routine and emergency care at 08:00 BST. The strike affects A&E, maternity and intensive care for the first time. Health Secretary Jeremy Hunt expressed disappointment that the stoppage was taking place, but again said the government would not back down and halt the imposition of the new contract. The walkout ends at 17:00 BST with further all-out action due to take place on Wednesday, between the same hours, in the protest against the imposition of the new contract from the summer. Speaking to the BBC, Mr Hunt described it as a "very, very bleak day" for the NHS, but said no union had the right to stop a government trying to act on a manifesto promise. "The reason this has happened is because the government has been unable to negotiate sensibly and reasonably with the BMA." Before the strike, government sources had indicated that they could not give in because the row had become political, with the BMA trying to topple the government, and other unions watching the dispute "like hawks". The BMA described this as ridiculous. During the stoppage, hospitals can request that junior doctors return to work if needed, but as yet, no NHS trust has raised the alarm. There have been reports that hospitals may be quieter than normal with patients heeding warnings to stay away unless absolutely necessary. Will services actually be safer during all-out strike? NHS England said the situation was being monitored carefully, but "military level" contingency planning had ensured hospitals were as well prepared as they could be. Media captionWhy are junior doctors on strike? NHS England's Anne Rainsberry said: "Clearly industrial action of this type can put significant pressure on the NHS. We have been working with all hospitals to make sure they have plans in place to provide urgent and emergency care." She said those plans were "robust" and hospitals were "confident" they could cope, but the situation would be kept under review. There are more than 50,000 junior doctors in the NHS in England, representing about a third of the medical workforce. Ipswich Hospital chief executive Nick Hulme said his trust had been coping well - and more doctors than expected had come into work, 23 out of 122, suggesting an all-out strike had been a "step too far" for some. But he said both sides needed to come back together to resolve the dispute "quickly", saying it was getting "really difficult" for the NHS to cope with the backlog of postponed operations. A new poll by Ipsos MORI for the BBC showed the majority of the public still backed junior doctors, although support was not as high after it became an all-out stoppage. Asked whether they supported junior doctors striking while not providing emergency cover, 57% said they did and 26% said they were opposed. The last time the public was asked was ahead of the 48-hour walkout in March, when emergency cover was maintained. Then, 65% supported junior doctors. The poll of more than 800 adults in England also found a growing number of people blaming both sides for the impasse. Some 35% said the government and junior doctors were at fault. The majority - 54% - still blamed the government. The dispute is about working hours and pay, but a key sticking point is about payments for working on Saturdays. Talks between the government and British Medical Association (BMA) broke down in January, prompting the government to announce in February that it would be imposing its contract in the summer. The strike comes after last-minute pleas from medical leaders, patient groups and opposition MPs for both sides to get back round the negotiating table. National Voices, a coalition of patient groups and charities, even offered to host talks. Chief executive Jeremy Taylor said: "Patients and the public are caught in the middle - and the harm is being felt by patients and their families." BMA junior doctor leader Dr Johann Malawana said if the government had scrapped his plan to impose the contract, the union would not have taken this action. "No doctor wants to take any action. They want to be in work, treating patients, but by refusing to get back around the negotiating table the government has left them with no choice but to take short-term action to protect patient care in the long term." Are all-out strike days actually going to be safer?